Fresh and saltwater eel have played an important role in Japanese culture and cuisine for thousands of years. Traditional methods have shown to be hugely popular worldwide, leading to increased demand that is putting a strain on wild populations. Fresh and saltwater eel are used very differently in Japanese cuisine. Unagi (freshwater eel) is known for its bold, rich taste, while Anago (saltwater eel), is a more muted choice, known for its incredibly soft texture and natural sweetness. Both Unagi and Anago have played an important role in Japanese cuisine and culture for thousands of years, but the freshwater eel in particular has been making news as an at risk species. Unagi is full of protein, vitamins and calcium, which may have influenced its role in the midsummer tradition of eating Unagi on the Day of the Ox in order to aid one’s strength and vitality for the coming year. In addition to its strength giving properties, legend has it that Unagi is a powerful aphrodisiac. If you are served Unagi by someone versed in the lore, they may have other intentions than simply feeding you! Unagi is prepared through the same traditional methods that have been used for thousands of years and which bring out the bold, rich flavors of the dish. Once the eel has been filleted and deboned, it is grilled over an open flame which serves to melt off the layer of fat which lies under the skin. The eel is then steamed, drained of oil, and basted in a sweet eel sauce. The final and most important step is the second grilling, allowing the eel to absorb the flavors of the sauce. Because Unagi has such strong flavor, it often served on a simple bed of rice or as sashimi. 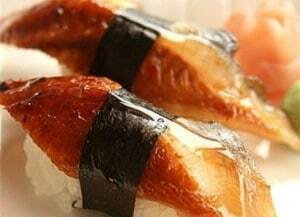 Unagi sushi is called unakyu, and pairs the richness of Unagi with the refreshing crunch of cucumber. Unagi is hugely popular in Japan, and has spread worldwide as a delicacy. It is most often enjoyed on hot summer days, with entire restaurants devoted to dishes of Unagi. As worldwide popularity has risen, stocks of freshwater eel have crashed. This has lead to concerns of the stability of the industry. With wild stocks plummeting, producers of eel have switched to farming the product, with 90% of the eel currently sold in the US being farm raised. Farm raised eel unfortunately does not mean that the wild population are left untouched. The farming process is not done by spawning eels in captivity from eggs, but rather by collecting young eel from the wild before they have a chance to breed. There are also concerns that the open net pens used in the farming process allow disease, parasites, and farm waste products to flow from the pens to the surrounding wetland habitats of the eel. It is for these reasons that Seafood Watch, a sustainable seafood database, has recommended that consumers avoid the product. Unlike its controversial freshwater cousin, Anago (saltwater eel) is more well known for its sweetness and soft textures which melt in the mouth. Anago is often simmered for sushi or deep-fried for tempura. Anago are found in the Northwest Pacific, especially off the coasts of Japan where they make their homes in the sandy, muddy bottoms of the sea. They are frequently captured and cultured in Japan. While currently they do not have an at risk status, the industry is relatively new and untested. Eel plays an important role in Japanese culture and cuisine, and is a delicacy in the heat of the summer. However, the ever-growing popularity of the dish has lead to concern over its sustainability.